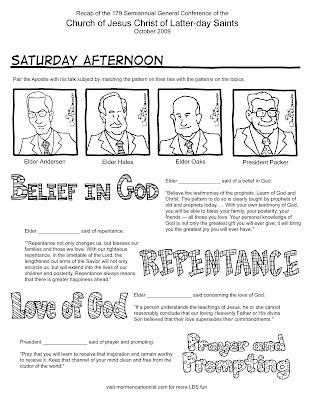 Here's a fun General Conference recap you can print off and use for Family Home Evening. And remember for lots more activities, puzzles, and mazes; my books The Puzzle Book for LDS Kids and The A-MAZE-ing Book of Mormon are available in finer LDS bookstores everywhere. It should be abundantly clear that I am more a cartoonist than a charicaturist. 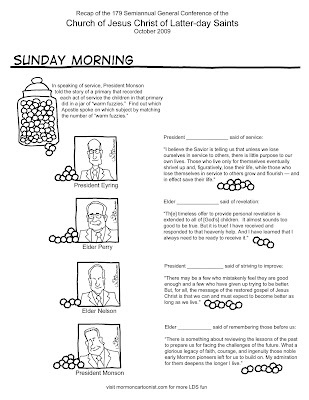 That being said, I still had a great time trying to capture the likeness of the First Presidency and the Quorum of the Twelve (with varying degrees of success). 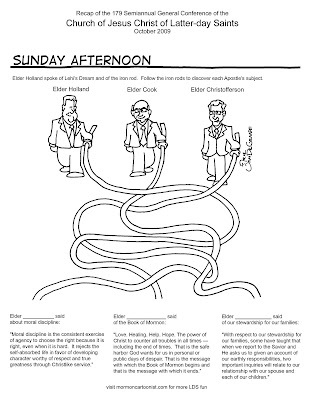 Sadly, Elder M. Russell Ballard didn't make the cut (he spoke in Priesthood Session). These pages are great. Thanks for sharing. Our family will defintely use them for Family Home Evening. You are very talented. I think you did a fantastic job with the likenesses of the Apostles. My favorites are Elder Perry and President Eyring. Nice work! Hey, can I post a link to this on my BOM and D&C blogs? All my other blogs are private. Oh, and I just posted the link on my Facebook profile. Is that okay? Thank you!! I can't wait to share these with everyone I know. Great Work!! My screen resolution isn't so good. In that last panel, are they holding long pieces of spaghetti? Thanks for this! FHE is now done! So fun. 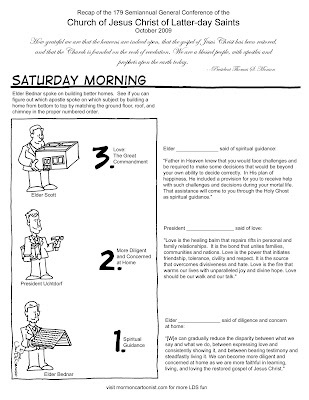 I've been re-writing some of my mission experiences into story form for my kids. It has been fun to relive some of the more unusual experiences from Slovenia. Arie, thanks for your talent. I am featuring talent like yours on my new blog. 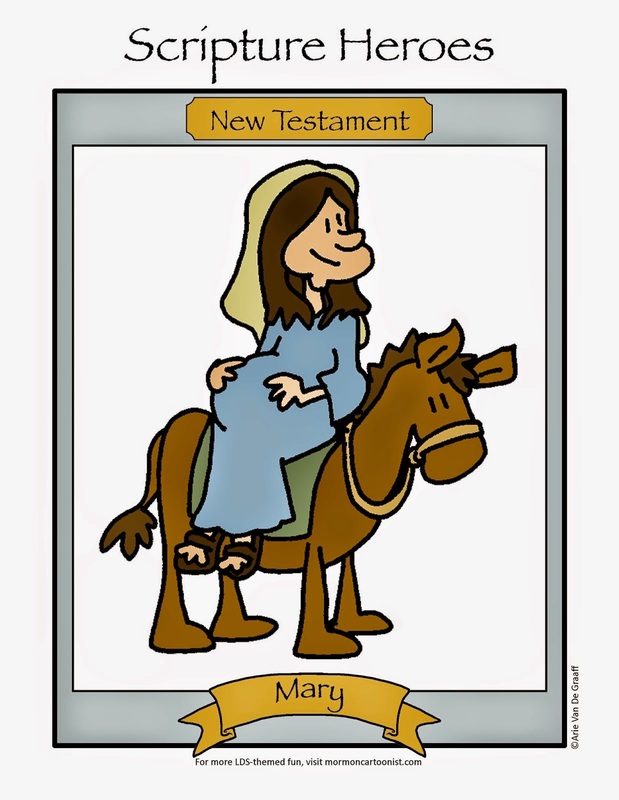 It is http://funnymormons.com I want to create a central location to showcase lds comedians, cartoonists, and other "funny mormons"
Our primary used your game with the warm fuzzies in sharing time today. They said they downloaded from some church internet site (you probably know what it is). Anyway, I was very proud. The site Jena is talking about is Sugar Doodle, a go-to website for anyone looking for lesson ideas. Thanks for sharing your talent! My kids will love this.